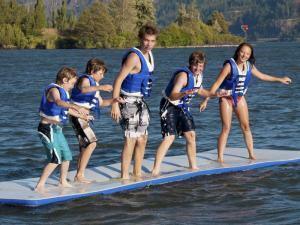 The Aquaglide Splashmat is an 18' long flexible, slippery and downright wiggly water float. Technologically advanced 'dropstitch' material is incredibly durable and smooth, yet extremely low profile for easy boarding and maximum splash. Inspires continuous, creative free-play, not to mention a serious case of the giggles for up to eight users. Can be used as a stand-alone item or as an attachment for nearly any Aquaglide Platinum item. 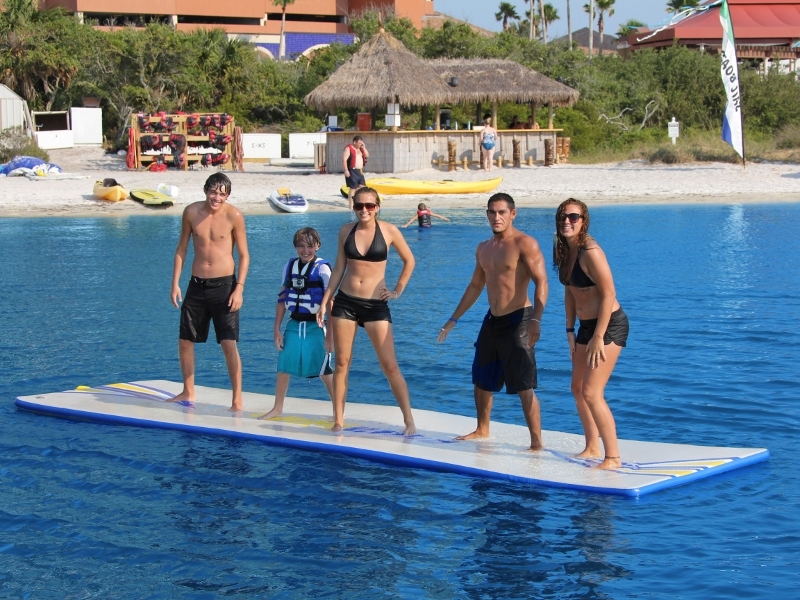 Attach to the end of the Aquaglide Summit or Freefall Extreme for maximum sliding fun. How does the Aquaglide Splashmat compare to Foam Mats? The Splashmat won't get water logged, it won't tear or rip during use, it won't get heavy and awkward to use, store or transport, your dogs won't pierce the material, it won't curl up on you while on the water, and it won't rot in the sun or smell. The Splashmat is quick and easy to inflate. It folds up compact for easy portability and storage. For use with up to 8 people, 1600 lbs max. Easily inflated anywhere with a foot pump (included) or high speed inflator available separately. Dropstitch fibers for a low profile, smooth inflatable floor.